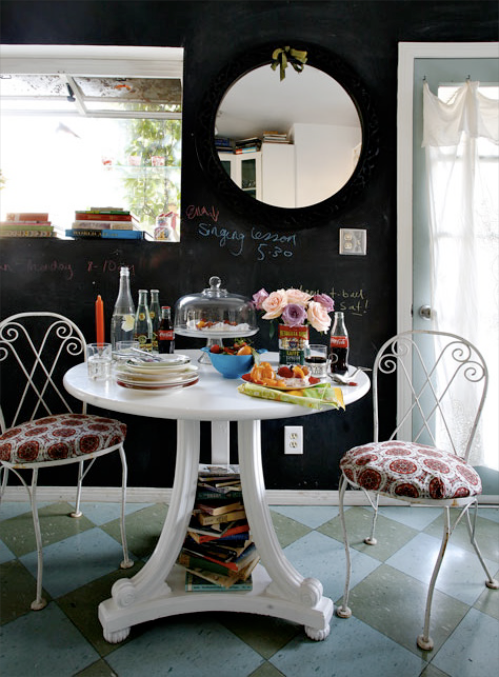 What do you think of chalkboard walls? Currently, they're all over the design scene. I spot them most in kitchens, kid's rooms, and workspaces. Creating one is as easy as buying a can of chalkboard paint! I can certainly see myself experimenting with this 'easy to do' idea one day. They're whimsy, creative, practical, and you can write inspirational quotes all over them (that's what I'd do!). Incredibly tempting! I definitely want to put some chalkboard paint in my son's room. I love the photos you posted though, I'm not sure that I would be gutsy to do an entire wall in my kitchen. But these are soo cute! I LOVE them in any room, and I'm definitely putting a large one in my new art studio!! Not to be a wet blanket, but just wanted to give you fair warning. They are a nightmare to paint over. I have a client who moved into a house with a chalkboard wall in the kitchen. After coats and coats of paint, the chalkboard is still visible. I love it! Def want in my next home. I really love how dramatic that looks. I could really go for that in a space that has lots of natural light. Beautiful pics. I don't know if I would do it myself but they're cool. I love the idea for a kid's playroom. Having one on the wall behind the bed like in 500 Days of Summer is also fun. 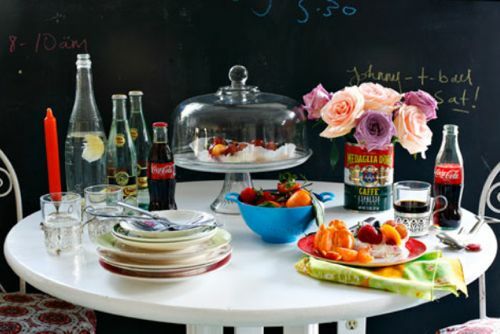 I love this idea- and have used chalkboard paint thru my entire house- in different rooms. is really that easy? i would make such a mess! We have this in our playroom, love it...but now I suddenly want to go and write inspirational quotes and french sayings all over it! I love the idea, especially for a kitchen. Kids can play and you can write your shopping list on there. These shots you posted are so pretty! the chalkboard idea is my latest obsession...really cute idea! I am loving this idea, and think it fits perfectly in these settings as well. I just want to go have coffee there! I've yet to come across any little cafe or coffee shop with walls like this, but wouldn't that be so cozy? I love them, but hate the feel of writing with chalk...and the thought of touching the walls make me cringe. Which is why I have all glossy walls in my house. I can't do matte. It's sad. I was just thinking today to make a picture of my chalkboard hallway... So I can only say ;yes I like it; and not only in childrens rooms. This does have a girly eclectic feel to it. I have 5 girls & I NEVER painted a wall for them. I really am just so nervous about the chalky mess??? I never hear complaints though. I think chalkboard paint is awesome! I like it in small doses though...I don't think I'd do a whole wall in a kitchen, but perhaps one area with trim around it for function (adding to the shopping list, writing memos to family members and keeping the kiddies occupied while wiping up some food)! I need one in my office. I'd paint it dark purple though!! In NZ House and Garden they featured a beautiful picture (which I will be putting up soon on my own blog) of a dining room where an entire wall had been painted in chalkboard paint, feature wall style. Then, in cursive script, they had written up a scene from a Shakespearean play. It really worked. I say: Go for it!! You could always paint over the chalkboard paint after a while. I love chalkboard walls! Highly recommend them! We have our doors to our pantry done with chalkboard paint (in the kitchen) -- we painted them 3 years ago, and they still look pretty much brand new. We also painted sections above our large bay window, framed with moulding... David, being the artist that he is, drew out a maps of Paris, a city scene and lovely motifs. i luv em! i know my hubby will go crazy if we had these kinda walls in our dining room, he's a doodler, lol. love that table too and cute chairs.